Intuition is an important part of decision making. Although your gut brain (properly, your enteric nervous system) doesn’t do thinking, it does control your digestive system, and interacts with your brain. So, there’s a lot of sense in letting your gut, or your intuition, inform your decisions when managing projects. Intuition is when we just “know” something, without thinking carefully about it—or even gathering full evidence. I put “know” in quotes because often intuition can let us down. What we know through intuition is often not true. So, you need to be careful what you wish for; a powerful intuition can be convincing, yet lead you astray. I like the metaphor that Malcolm Gladwell uses in his popular science book, Blink: The Power of Thinking Without Thinking. He refers to intuition as “thin-slicing.” It’s as if our brains are able to perceive the huge array of information in a complex situation, and cut a thin slice through it to get to the most salient facts. From these it forms its judgement. That’s intuition. It seems to me that Gladwell’s book leans heavily on the work of research psychologist, Gary Klein. Any serious project manager would do well to read his books. I especially recommend The Power of Intuition: How to Use Your Gut Feeling to Make Better Decisions at Work. Intuition works best when you have deep expertise. Any project manager might have an intuition about this or that topic. But for reliable intuition, you need a lot of experience. Experience builds the neuron connections in your brain. These allow you to create a rapid assessment of a complex situation. This can short-cut rational consideration in a productive way. It’s faster than considering all the details, but the experience makes it accurate nonetheless. Another book every project manager should read is Daniel Kahneman’s Thinking, Fast and Slow. In this book he shows how rapid intuitive thinking usually lets you down. Our brains prefer to take mental short-cuts, so they follow ingrained thinking patterns called heuristics. But we can reconcile Klein’s and Kahneman’s work: the key is that long experience of complex situations allows your brain to develop and access reliable short-cuts. The upshot of this is simple. To develop project management intuition you can rely on, you must practice as a project manager for a long time. But I would go further. What you need is deep familiarity with a set of complex situations. So, this means a degree of specialization. Also, a career where you work on ever-more complex and demanding projects helps. There’s something else too. It’s easy to have an experience and then move on. To hone your intuition, build reflective practice into your work routine. Take time out regularly to reflect on your experiences. Make notes on the things that happen, the decisions you take, and the way events play out. It’s less important to try to draw conclusions than it is to consider and record what happens. Your brain will start to form the neural connections on its own accord. Sometimes it can be hard to hear your intuition. And these are also the times when it’s hard to think carefully about the facts of the situation. So, in these cases, our brains often default to careless shortcuts, and we jump to conclusions. The same bustle of day-to-day project life that robs us of the time to think also drowns-out the quiet voice of our intuition. To access your intuition, you need to make time to ponder. Take a walk, savor a cup of coffee or just sit quietly. Then, remind yourself of the problem at hand, or the question you want to answer. On one project I led, I would often record my whereabouts as Meeting Room 5. One day, a colleague pulled me up on this. “We were looking for you,” he said, “and there are only four meeting rooms in the building.” That was because Meeting Room 5 was the local coffee shop. It was there I did my best thinking—for half an hour, every week. Of course, to access your intuition, you need to be clear about the question you want it to answer. So, spend time framing the question and getting clear in your mind what you want to know. A lot of the heavy lifting in resolving problems happens when you work to understand the problem. Go deep enough to frame it clearly. Then allow your brain to mull, to hold the question and give your intuition time to work on it. That’s why in the UK we have a saying that you should “sleep on a problem.” Typically, it will be when you are least busy that your brain will give you access to the answer it’s found. That’s why so many people report having a eureka moment while in the shower, or while travelling. Intuition is your brain’s way of synthesizing vast amounts of information, and drawing a conclusion, based on recognizing a pattern deep within the data. So, to prime your brain’s pattern-recognition, you need to feed it constantly with data. Start noticing what’s going on around you. Pay attention to the small details of your environment, of what people do and say, and the way they do and say things. In fiction, Sherlock Holmes’s intuition arose from the acuity of his observation. Start looking and listening for subtle clues. What Does Your Body Think? It’s not just external data that matters when you want to tap into your intuition. There are plenty of clues to your unconscious feelings about a situation in the way your body reacts. How are you breathing? Is there tension in your neck or shoulders? How fast is your heart beating? What is your posture like? When you are with someone, does their presence make you relax, or feel jumpy. And, do you remember the importance of your gut-brain? Sometimes you can access your intuition via your enteric nervous system. Do you feel a queasiness, a rumbling, or butterflies in your stomach? To access your intuition, you often need to find the right place. There are two opposite solutions, both of which can feed your intuition and give you access to it. Japanese industry often uses the concept of “going to the Gemba” as a part of problem solving. As a project manager, I’ve found this a valuable approach, even before I knew a name for it. The Gemba is the place where something happens. Sitting in an office thinking about a problem is rarely as effective as going to the scene. You can talk to the people there, see things for yourself and gather data. But sometimes, you need to get away from a situation. Take a proper break, change your environment and get moving. Sometimes it helps to be on your own. That’s why Meeting Room 5 worked so well for me. It was there that I spotted what was coming around the next bend on a long and complex project. What if neither the Gemba nor getting away help? Then take a page out of the creativity playbook. Feed your intuition with some random stimulus. Browse the web for interesting articles, visit a museum or read a magazine. New ideas are like the tiny grain of sand around which an oyster grows a pearl. They catalyze new thinking and often give you an insight into the question you are holding. Let’s make a couple of last passes over the strop to put a perfect edge on your intuition. Scenario planning is a perfect approach to let your intuition out and put it to the test. Mentally rehearse good and bad scenarios, gentle and extreme. This will give your intuition a range of outcomes to ponder. After considering them, how do you feel about the decision now? Excited or fearful, calm or empty? This is the basis of one of Gary Klein’s best contributions to us as Project Managers. I love his pre-mortem technique. I wrote about that in my earlier article about identify risk. Applying your intuition effectively means avoiding the artificial constraints of do or do not, yes or no, in or out. Instead, look for what’s interesting. Find alternatives to the easy polarities. Life is rarely that simple, and if you allow your intuition to find the easy answer, it could as easily be wrong. So, look for alternative directions you could take. Maybe there is a third way. Your intuition can get it wrong—sometimes badly. Some of the experience it hooks onto may not be relevant, and this leads to bias and error. If you don’t have enough depth of experience, this becomes increasingly likely. This is what a lifetime of research (for which he won a Nobel Prize) taught Daniel Kahneman. And that’s the reason why the best project managers are often coolly calculating, careful, and rational. So, test your hunch by looking for evidence. It is all too easy to fall for the confirming evidence trap of looking only at evidence that supports your conclusion. So, for most rigor, focus on a search for details that go counter to your intuition. Test your ideas and try to break them before you implement them. 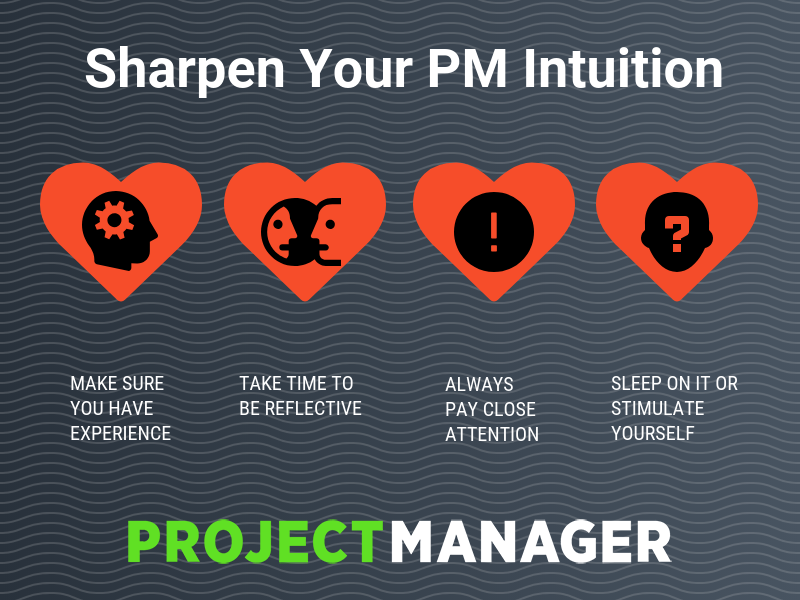 If your intuition is telling you that it’s time to get a project management software that gives you instant insight into your project with real-time dashboards, and one that allows for collaborative planning with an online Gantt chart, then follow your gut to ProjectManager.com. Our cloud-based tools are robust and serve every aspect of your project. See for yourself by taking this free 30-day trial.